Our SEO agency has helped many of our clients improve their website rankings and traffic over the years. 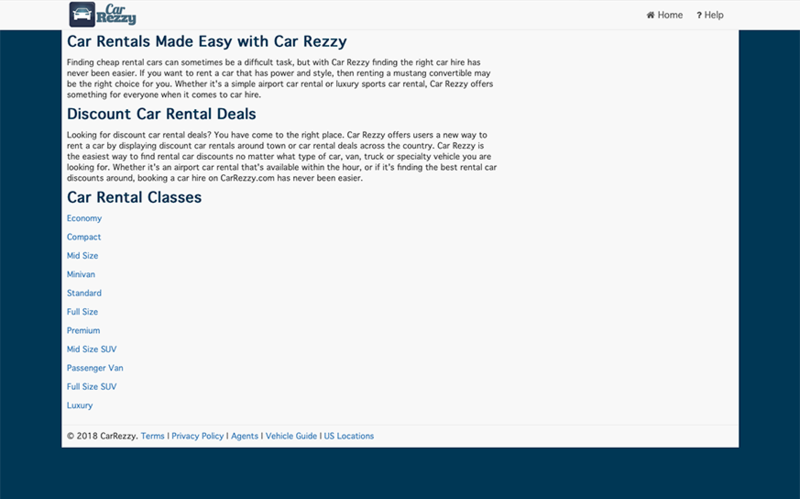 Car Rezzy is a car rental reservation site. The thing that makes them stand out is that they display a map of live car rental prices from various vendors in the surrounding area. Car Rezzy is currently operational in the United States, Canada, and Mexico. They plan to expand their service areas to a global scale shortly. We usually focus our local SEO efforts on creating quality content for our client’s websites. Our role on this project was to create content pages that encompassed the latest SEO best practices. We started by analyzing the car rental industry’s search environment. We then outlined a content creation strategy for the project. Our SEO agency primarily focused on writing content about travel activities in major US cities. By the end of the project we had written about fifty pages of content for CarRezzy.com. We were happy to see that our campaign significantly built up Car Rezzys website content.